We look forward to every media report about SCHLAF-FASS and do not want to withhold any exciting articles from you. 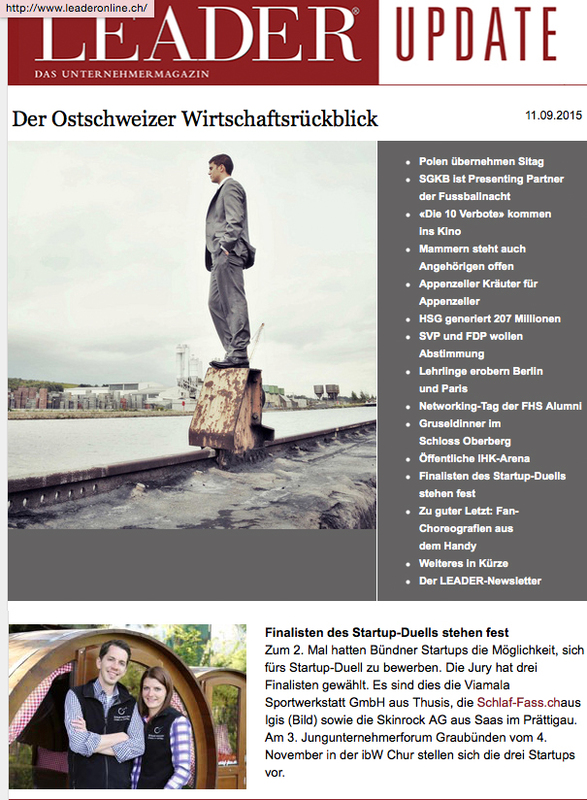 Newsletter-Report in the entrepreneur magazine «Leader update» to the final nominatet as young entrepreneurs 2015. 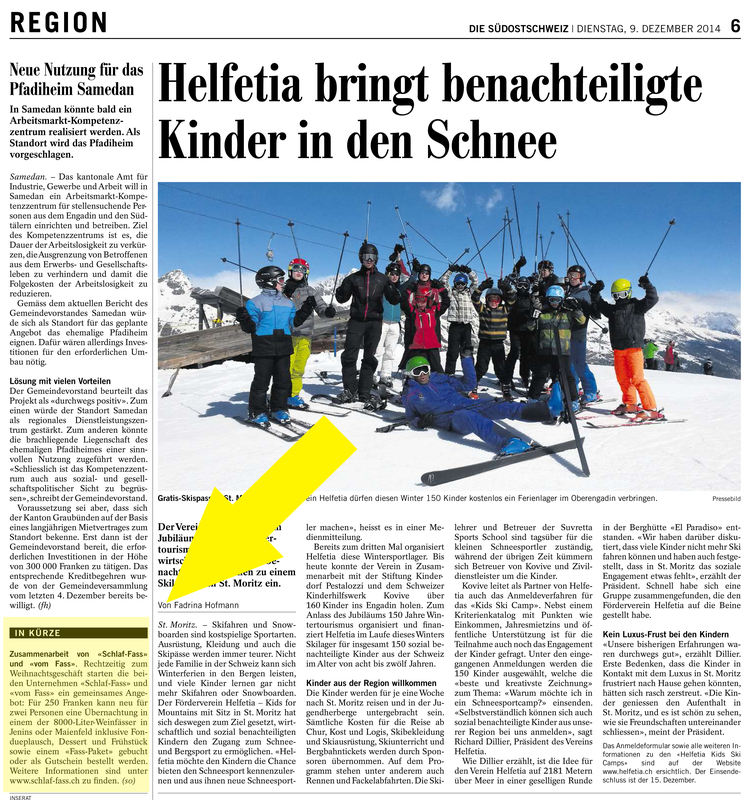 Newspaper report for nominating at the final of the SCHLAF-FASS as young entrepreneurs 2015. 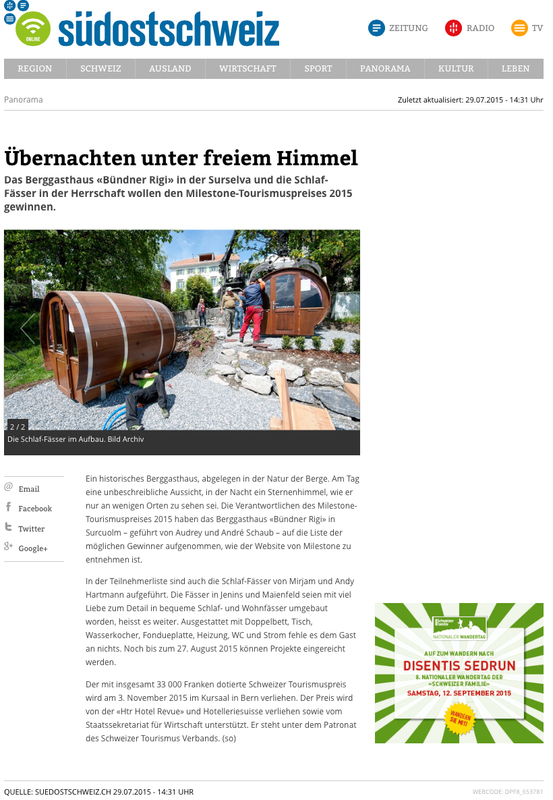 The newspaper southeast Switzerland reports on the application input at the Swiss tourism price «Milestone». Report in the magazine for holidays and lifestyle «Bündner Stern». Globe TV visited us für a TV-Report about the SCHLAF-FASS. The specialist journal for the hotel trade reports for the first time on the SCHLAF-FASS. 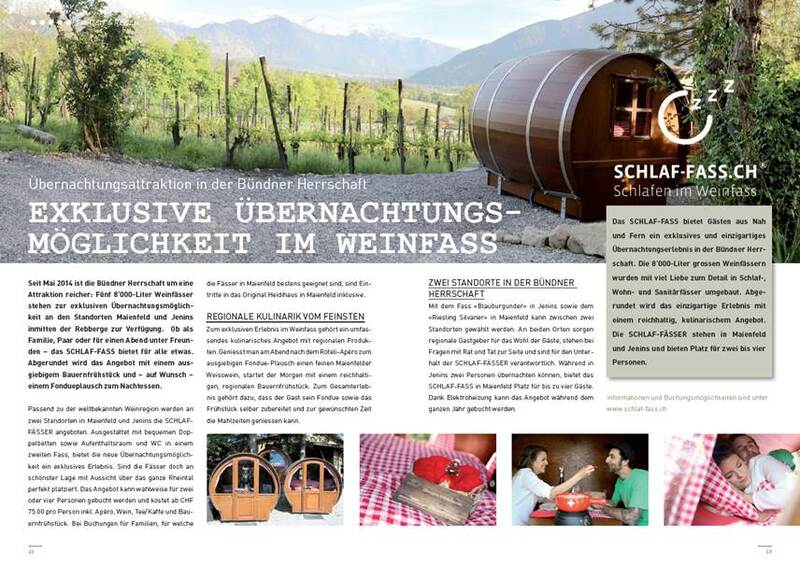 The weekly paper Büwo reported on our new barrel and the SCHLAF-FASS Cheese Fondue. 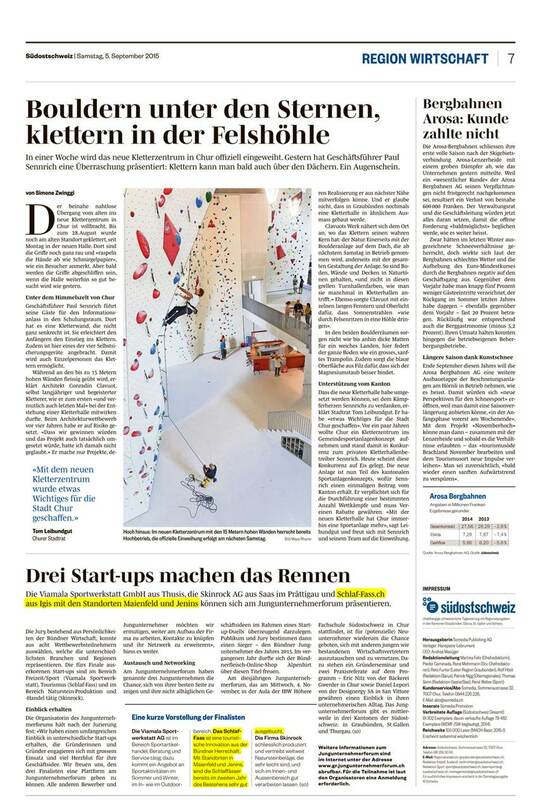 The Newspapper Bündner Tagblatt reports on the development of the SCHLAF-FASS. 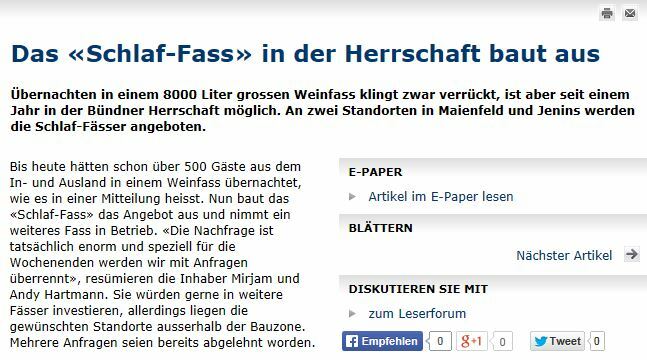 On suedostschweiz.ch was published an on-line reports of the SCHLAF-FASS. 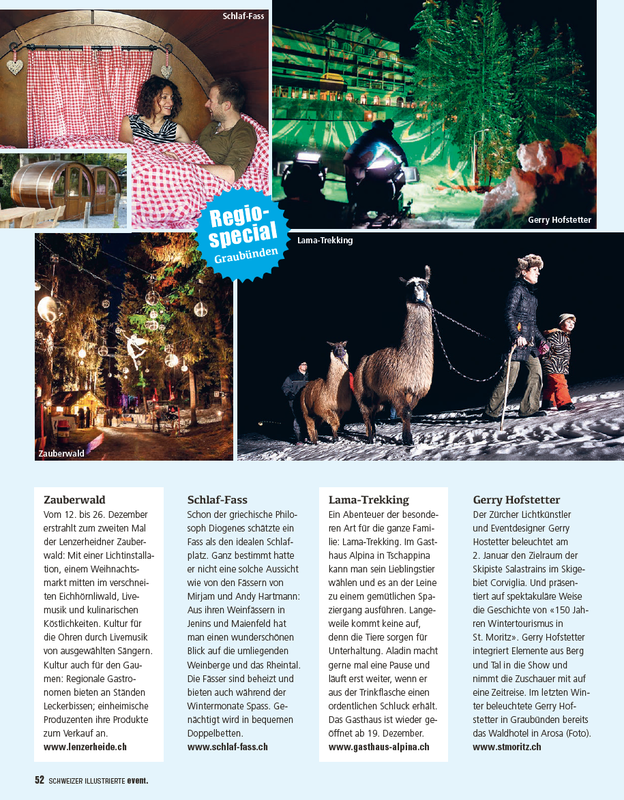 Travel and spare time the magazine «SPOT» visited us few days ago and published a whole page over the SCHLAF-FASS. In the magazine event. Swiss pictorial was reported on the SCHLAF-FASS. 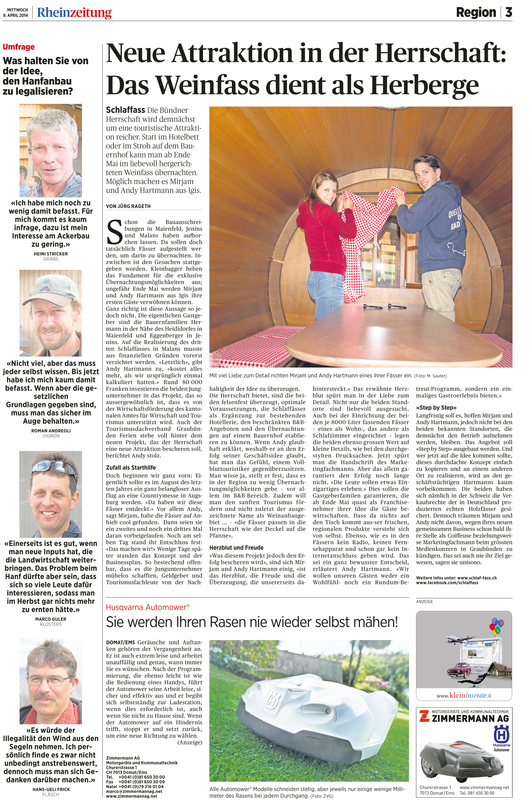 The largest daily paper of the region reports on our new co-operation with the company OF the BARREL in Chur. The SCHLAF-FASS has sponsoring the price for the Advent competition number 3 of the Newspaper Bündner week. Our agency «skipp» to us in the newest customer magazine a whole page dedicated. www.travel360.be in Belgium a report was published to the sleep barells. On reishonger.nl a detailed report about the sleep barells. Report about our guests 99 and 100. Report in the "Graubünden magazine"
Beautiful, multilateral picture report in the "Graubünden magazine". A detailed interview for the business emergence of the SCHLAF-FASS. Tele southeast Switzerland visited us during the official barrel initialization and transmitted a report. Switzerland tourism published our supply immediately as exclusive overnight accomodation hint on the web page. Report of initialization of the sleep barrels. The probably most famous Capricorns of Graubünden holidays visited the sleep barrels. Report for initialization of the sleep barrels. Fotoreport for initialization of the sleep barrels. Report in two sections of radio Liechtenstein. FM1 reporter Linda Aeschlimann visited us in the case of the barrel feed and made a report. Short photo report in the largest, local daily paper. 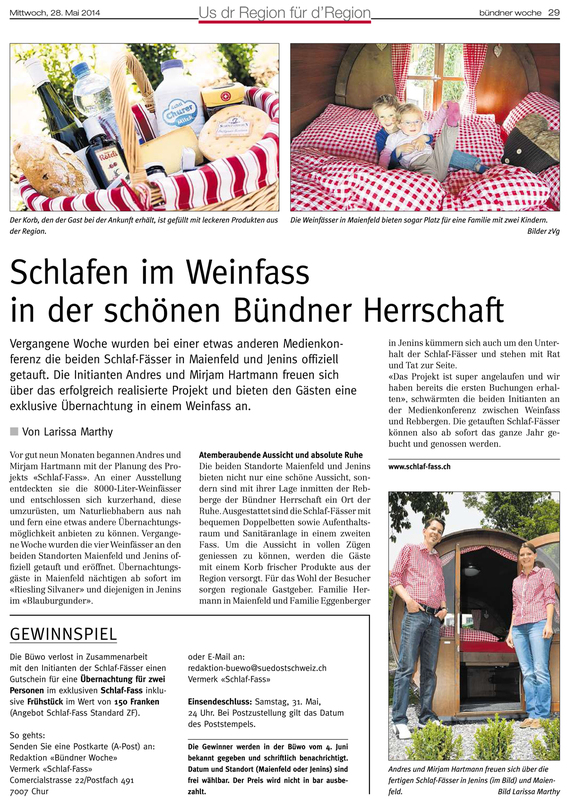 Report for the feed of the SLEEP BARRELS in the «Bündner Tagblatt». Another great post about our SLEEP BARRELS. Exciting report in the newspaper for the emergence of our SLEEP BARRELS. The delivery of the SCHLAF-FÄSSER by video and audio. There is even a Song about the FASS. Exciting Article on Tele Südostschweiz. Starting at 02:20:00 minutes the SCHLAF-FASS will get a chance to speak. We only became aware of this during the broadcasting in November 2013.